Read this mini-book as a PDF file using the free Acrobat Reader. Select this link to download it. We serve the grieving by offering information, encouragement, and inspiration through a variety of media. 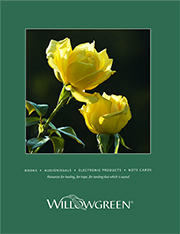 We post mini-videos, mini-books, photothoughts, and writings by Jim Miller and guest bloggers. We invite your helping thoughts too. James E. Miller is a writer, photographer, and presenter who has written many books and created even more videos on loss and grief.